At Arcadia Congregational Church, we have the facilities you need to have the wedding or reception of your dreams. Our Weddings and Receptions are open to all denominations and people. Ceremonies in Spanish are provided. Guest ministers are always welcome. We have a Bridal Consultant available to help you plan the wedding you will cherish always. 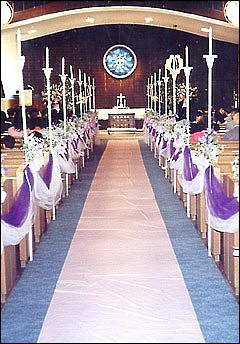 Our facilities include a modern, open sanctuary and can seat up to 380-400 guests and features a 76 foot center aisle. The sanctuary overlooks part of our gardens. Our beautiful park like grounds offers many areas to host an outdoor ceremony or reception. Our tree shaded gardens can offer many places for your special moments and picture memories. We can provide decorations, runners and more, or you can supply your own decorations. There are 2 wedding hostesses to assist you. We also offer an upright piano and an authentic pipe organ, as well as a modern sound system, for your services. We also have an historic mansion, formerly owned by Prince Erik of Denmark . This historic building can host a reception up to 100 people, and also offers some incredible architectural details for photographic opportunities. The main garden area can accommodate over 500 people, surrounded by stately trees and beautiful flowers and plantings, for an outstanding and peaceful outdoor ceremony. The garden area behind Prince Erik Hall is also a lovely area for your reception. 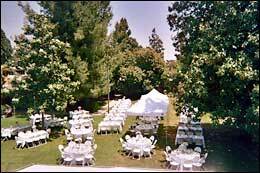 This beautifully canopied site which can hold 240 people is the home of Santa Anita Gardens Catering. You can find them on the web at http://sagardens.com/PEH/ . Arcadia Congregational Church is conveniently located near 3 major freeways, for easy access from nearly anywhere in Southern California and our parking facilities make for easy planning of any size gathering. With our beautiful gardens, semiprivate park like grounds, impressive open sanctuary and other amenities, Arcadia Congregational Church makes an impressive locale for your important and most memorable, special day. Contact us at (626) 447-8053 or email us at arcadiacucc62@yahoo.com for more information on our facilities, available scheduling, pricing information or to set up a tour to visit our facilities. We offer a wide range of options for your special day. See more wedding and reception photographs on our FaceBook page at Arcadia Congregational United Church of Christ.